By the end of May, the chickens that were hatched on March 1st were almost three months old. They had been kept indoors due to their small size and the cold nights that we have in northern New England. So coming to a new home in a hay filled coop was going to be some different for them. The long trip from my daughter's house didn't seem to bother them too much. And they took to the coop like they had always been in it. By instinct, I guess, they knew to go in to the enclosed part at night. We kept them in the coop with the built in pen for a couple of days so they could get used to it. Three of them couldn't wait to get out and explore their new surroundings. One of the hens was quite timid about leaving, but once out, they all stuck together. 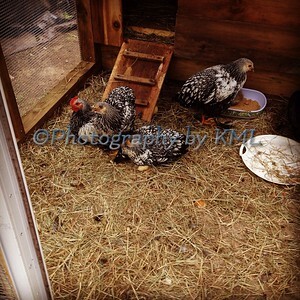 They stayed around the outside of the coop for a couple of weeks until they got braver. They are now free ranging all over the yard - eating all the bugs, seeds, and greenery they want. Three hens with their rooster protector. And do they have names - but of course - all pets do!